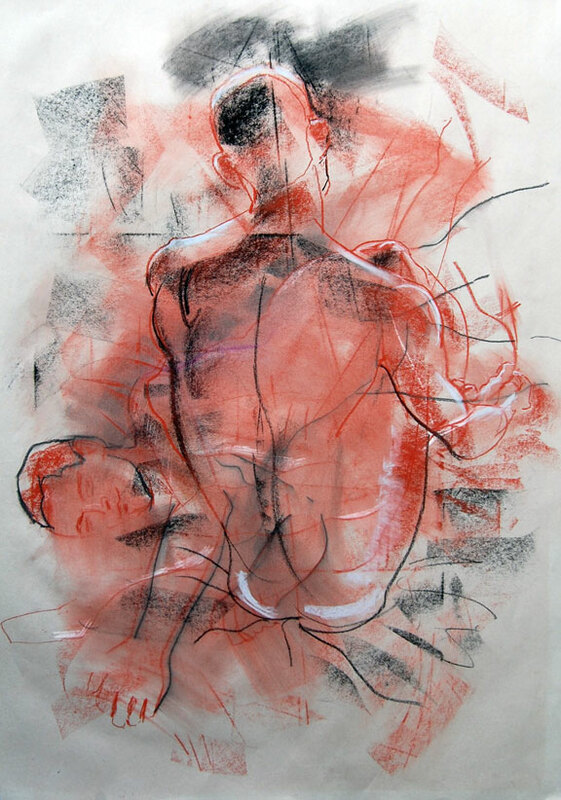 As an established artist and teacher, in my humble opinion – drawing CAN be taught ! However, you need passion, perseverance and practice – the more you do, the better your outcome will become and the more your confidence will grow. The key is an open mind – progress occurs when you are prepared to make mistakes, this is a vital part of the process – the trick is turning mistakes into opportunities ! In common with art itself, there are many ways of making a drawing and no one type of image making can be regarded as better than another. When students say to me they are “rubbish at drawing”, what they really mean is, they find it difficult – it is difficult – but with practice it gets easier ! Often, they find it hard to represent their subject matter in a realistic way and perhaps since primary school, they have mistakenly believed that they are incapable of getting any better – I would refute that ! We are all very capable of producing exciting, moving and realistic images – the creative juices just need unblocking. My own practice as an artist is closely liked to my research and more importantly, my teaching. I enjoy all forms of creativity and I get a terrific amount of pleasure from them – my mission is to share that passion with others. One of the most valuable things that I learnt as a trainee teacher was reflective practice and as artists we do that all the time and it’s this that strengthens and validates our outcomes. I teach drawing to people of all ages, all walks of life and from many different backgrounds. I have mainly taught in sixth form colleges, FE Colleges, Higher Education and adults from talented amateurs through to professional artists, designers, illustrators, animators and even principal lecturers ! 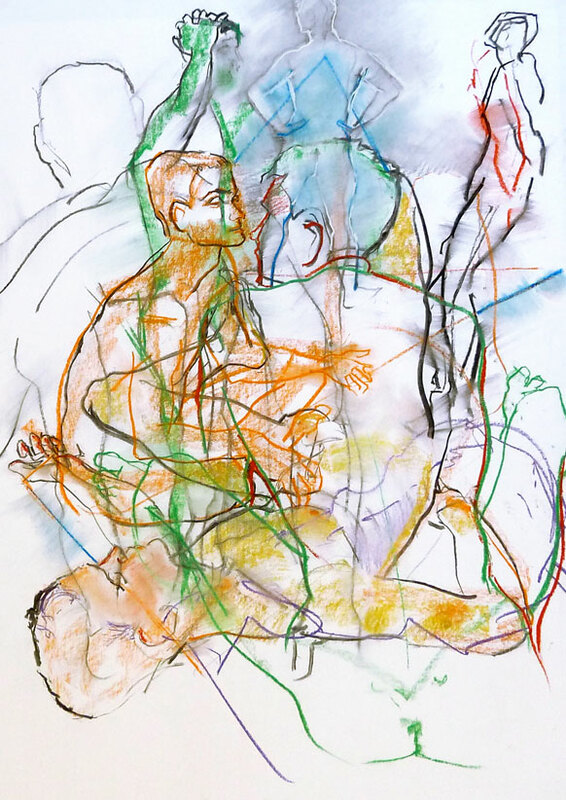 My EXPERIMENTAL LIFE DRAWING WORKSHOP is a 30 week rolling program, designed for learners of mixed ability : from emerging artists and designers – to ones seeking new directions or ways of responding to the human form. I have several students who have been attending my sessions since 1995 – why not join us ! GO to the MENU & select CLASSES for more information. At the University of Portsmouth I teach and demonstrate IMAGE CREATION and VISUAL COMMUNICATION to animation and computer games undergraduates. The course consists of 5 intense sessions of figure drawing, followed by 7 weeks experimenting with Colour, Environments and Composition. This culminates in designing a Concept Character(s) plus a real or imaginary environment. Next students demonstrate their compositing skills by initially creating an illustration, then designing a poster (with text) for a fictitious computer game. In addition to 2 hour weekly workshops the student is expected to complete at least 4 hours of SELF DIRECTED STUDY, the topic of which, usually follows on from each lecture. What follows is an assortment of demonstrations made during lectures with my computer games students. Week 1. Learning to LOOK is a vital part of the process ! THE PORTRAIT : Task 1.1: MEMORY & NOTE TAKING : Students split into pairs & write notes about the appearance of their colleague. After 5 minutes, their partner goes into another room and each draws their partner just from written notes and memory. 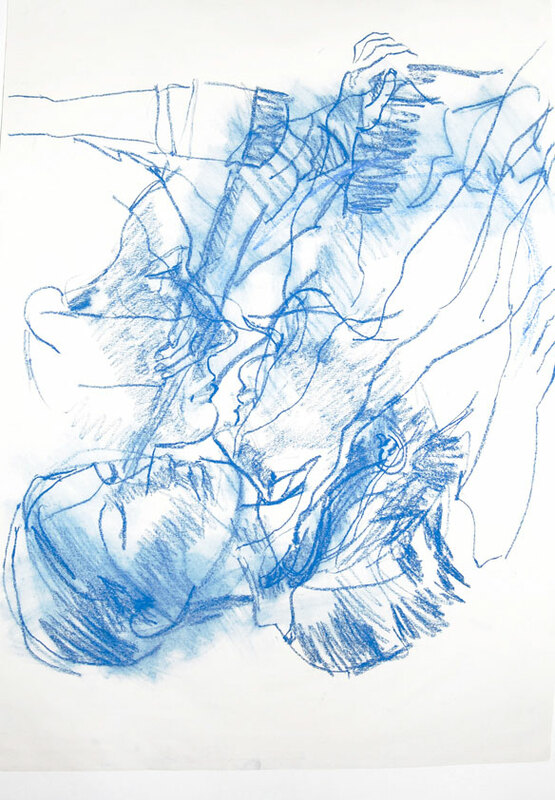 After 5 minutes of drawing in isolation, both artists meet up again and compare reality with memory. Evaluation: next the student records the outcome with a photograph and over the next 5 minutes a further OBSERVATIONAL DRAWING is made AND both drawings and photos are compared. A very quick portrait of a computer games student – he was drawn incredibly quickly, using charcoal on a flipchart. The paper is very smooth and not ideal for charcoal as it smudges very easily but this can be used to good effect – particularly when the tones (shading) are reduced or rubbed away with a putty rubber, as in the ears, nose, bottom lip and cheekbone. I also used a paper towel to smudge the background. Copyright Chrisnwood All rights reserved 2016. Another very quick study in line and tone. Online tutorials are very useful – for portraits I recommend the Andrew Loomis series of free books and on youtube check out – how to construct a face using REILLY METHOD by Galen. Week 1 : after drawing each other, we progressed, creating a 20 minute charcoal drawing of our model. This was made from direct observation. I added accents of soft coloured pastel later. 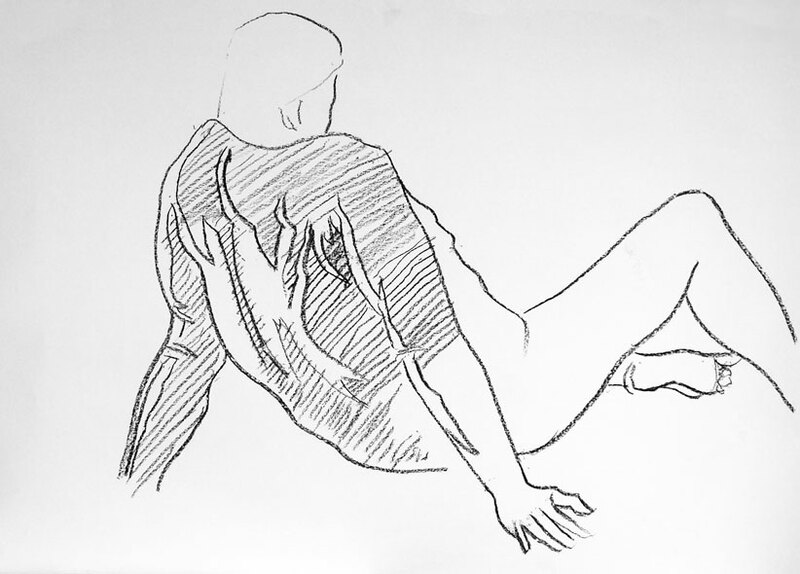 A gesture drawing is a very fast (10-15 seconds) scribble intended to capture the ESSENCE or dynamic of a pose – not necessarily the proportions or anatomy but the gist of the subject. Charcoal on grey sugar paper. 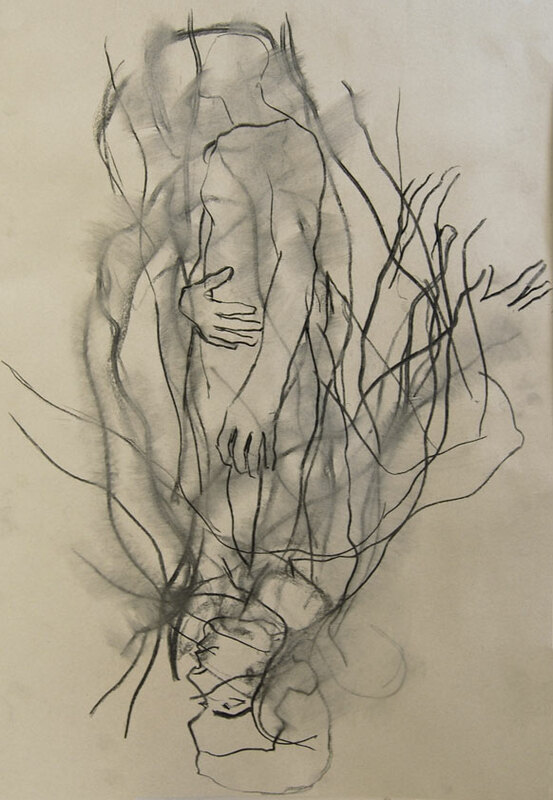 The aim was to draw a continuous line : plotting with the charcoal as the eye tracks back and forth across the forms. 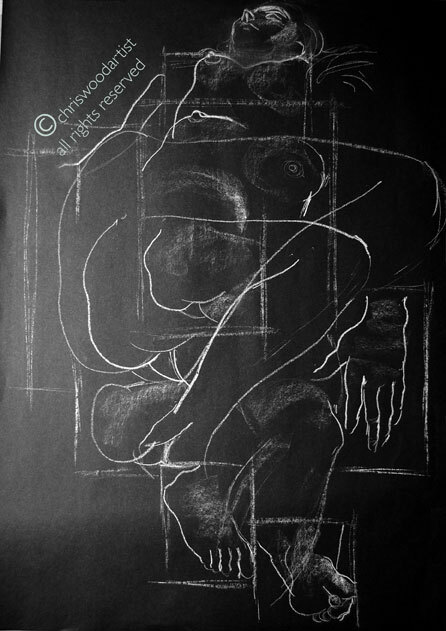 WEEK 2 : CONTOUR drawing Copyright Chris N Wood All rights reserved 2015 Charcoal on Arboreta heavyweight Sugar Paper. 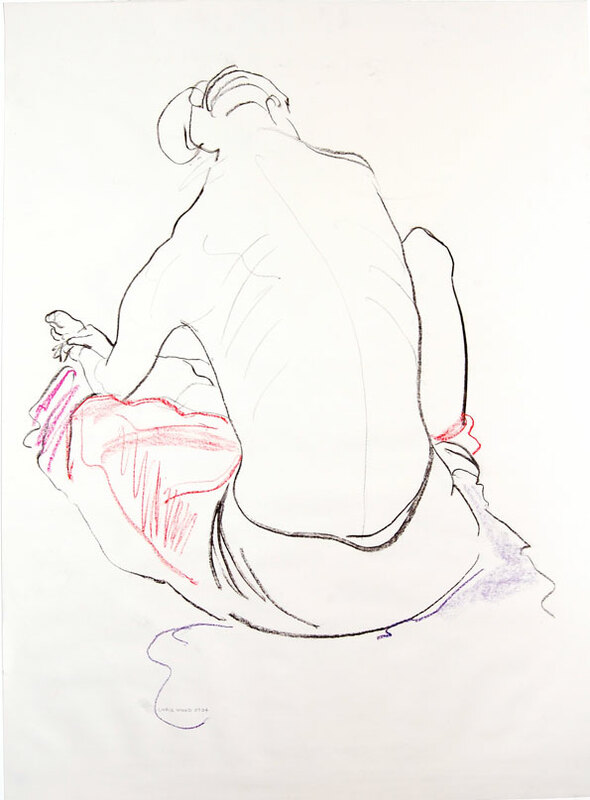 A contour drawing tracks around the outside edge of the pose with a considered line that should vary from thick to thin. Your pressure on the drawing instrument should also vary – thus producing light or dark lines to create emphasis. In the above drawing the line disappears completely in places, this might be where the edge of the model was hard to discern against a light background or where the edge of one form disappears into another. Drawing requires very careful observation, analysing shapes and forms. Graphite sticks are sold in a variety of forms but in my opinion the hexagonal sticks are the best. They are 1cm thick and 11.5cms long and can be used in the conventional manner or to add variety, hold them side on to the paper and drag them across the surface. NB : The “Koinoor” ones have a paper protective covering around the sides and this needs to be picked off before drawing with them side on ! Graphite sticks are NOT woodless pencils – these too are useful but not for our purposes. “CONTOUR Drawing” “Cyrus” Charcoal on Cartridge. 841×594 mm. “Blind Drawing” Oil Pastels © http://www.chriswoodartist.com all rights reserved 2016 : Each drawing was made without looking at the paper. The results are crude, childlike and spontaneous. Each new colour represents whether the left or right hand was used – judging by the results, I suspect the red was using my favoured hand ! Week 2. 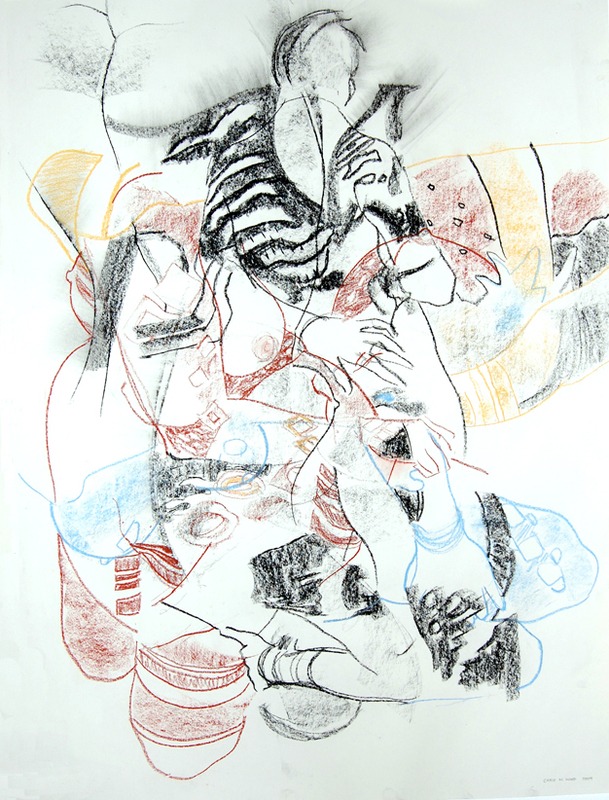 “Inverted Blind Drawing 2014” Charcoal on newsprint. © Chris N Wood http://www.chriswoodartist.com All rights reserved 13.11.13. Drawing blind : NOT LOOKING at the paper – completing one drawing then turning the paper 180 degrees and repeat. Week 3 Structure and Proportion : you can make an accurate record of a models proportions by counting the number of times that the head fits into the body. The Renaissance artist, DURER thought that the ideal was that an average male was 8 heads high. Our model is a very stocky professional wrestler, therefore his ratio is nearer to 1:7. Proportions vary hugely and when drawing someone new it’s always worthwhile checking the ratio. Here, MASS or VOLUME is drawn – the aim was to focus on building the bulk of the forms – rather than worrying whether a drawing looks anatomically right or wrong. A Koh-I-Noor graphite stick was placed on its side and dragged round and round working from the middle of a form to the edges. I exerted less pressure at the edges the cylinder of the torso. Quick Pastel, charcoal and chalk drawing on sugar paper exploring “MASS & FORM”. The drawing was made using a yellow pastel, which was placed on its side and circular movements continued until the basic forms were achieved. Lighter TONES were used for the edges and a darker TONE for the parts of the body that were nearest. Charcoal contour lines were added at the end to clarify the forms. MASS & CONTOUR charcoal, chalk and Conte pastels. Copyright Chris N Wood http://www.chriswoodartist.com All rights reserved 19.15 : 13.11.13. SHAPE : “SHAPE SHIFTER” Here we see the concept of Interpreting the pose as a BASIC SHAPE, taken to the “nth” degree ! The images were repeated a number of times & the model was drawn in a number of different SCALES. The overlapping SHAPES were coloured in to add an element of ABSTRACTION. Charcoal and pastel on grey sugar paper . © http://www.chriswoodartist.com all rights reserved 2012 Chris N Wood. “Sequential Movement” Showing construction lines and articulation points. © Chris N Wood All Rights reserved 2015 Each pose was no more than 2 minutes. Size variable. 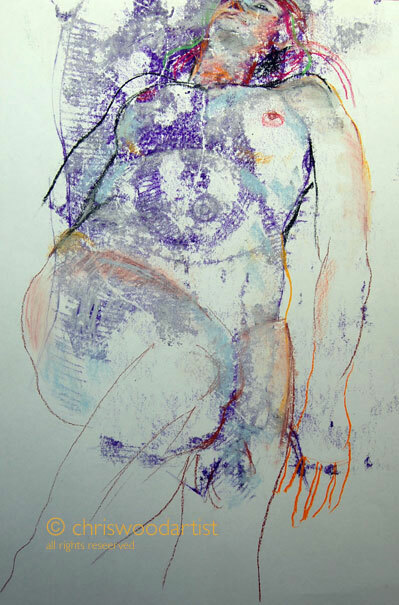 Drawings made using ink and broad brush plus pastel drawing of sextant. 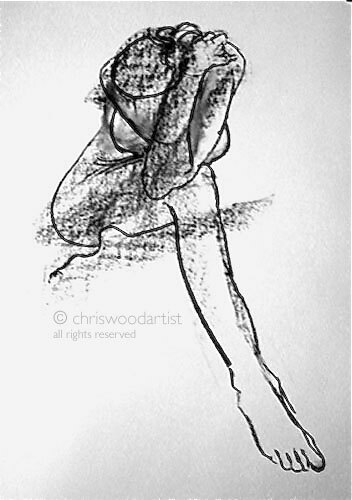 WET MEDIA : Hands “Pole Dancing”© Chris N Wood http://www.chriswoodartist.com All rights resererved 2014 Watercolour and Charcoal on Flipchart 760x582mm. POSTURE & BALANCE REVISITED : Lightning Studies in Line Only. Drawing the contour lines first in charcoal, then refining them using coloured “Art Pens” Each layer began with a 30 second drawing. Charcoal & Art Twin Coloured Marker Pens on flip chart paper 750x582mm. After returning to the studio I coloured in some of the SHAPES using a selection of oil pastels (bought in USA). You can see the texture of the sheet of water-colour paper that was under the thinner flip chart paper as I drew over the it. I also beefed up some of the marker pen lines and used an eraser to get rid of the charcoal marks. 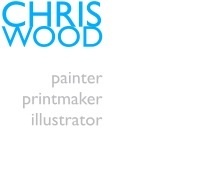 © http://www.chriswoodartist.com all rights reserved 2013. SILHOUETTES & GRAVITY : charcoal on flip chart paper 750x582mm. “The Ghost Formerly Known as Anne” copyright http://www.chriswoodartist.com.All rights reserved 2013. 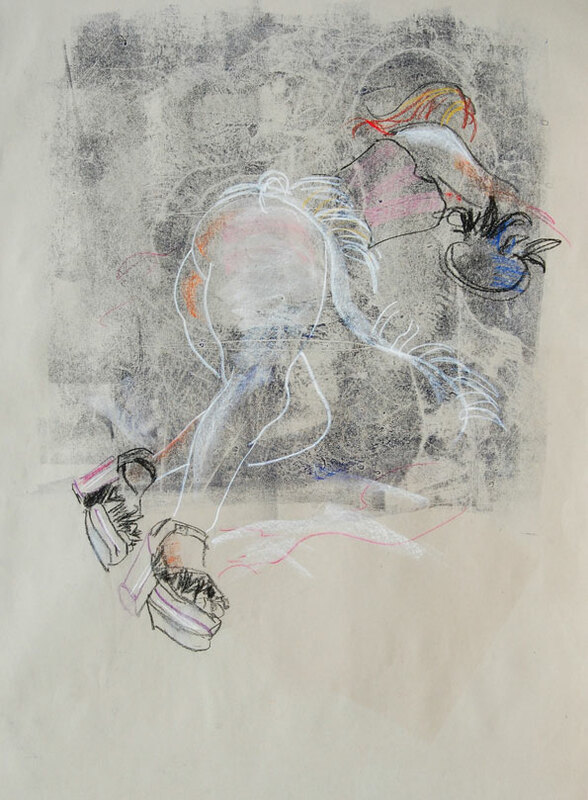 “POISE 1.” & “POISE 2.” A balletic series of drawings exploring the essence of poise – the turn of the head, balance, turn of the foot, expression as seen in hands. 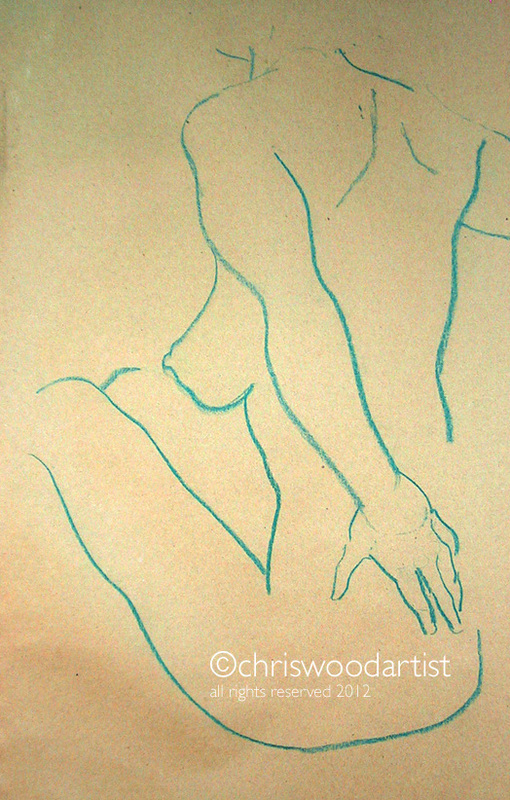 Note the construction lines and rough shape of the silhouette of tone that indicated the pose in seconds . RULER DRAWING : STRAIGHT LINES, FLAT PLANES & VOLUME “Mike in Contemplative Mood”Graphite Stick on Cartridge Paper. ©www.chriswoodartist.com all rights reserved 2013 First a stick man is draw to guage the proportions and angles across the limbs and angles of the limbs themselves. Then the outside edges or contours are drawn using straight lines ONLY. Next the sections are described and the flat planes across the FORMS to determine the edges of areas like the shins etc. “G”: Bamboo Drawing © chriswoodartist all rights reserved 2012. Charcoal on A1 (841 x 594mm) Cartridge Paper October 2012. 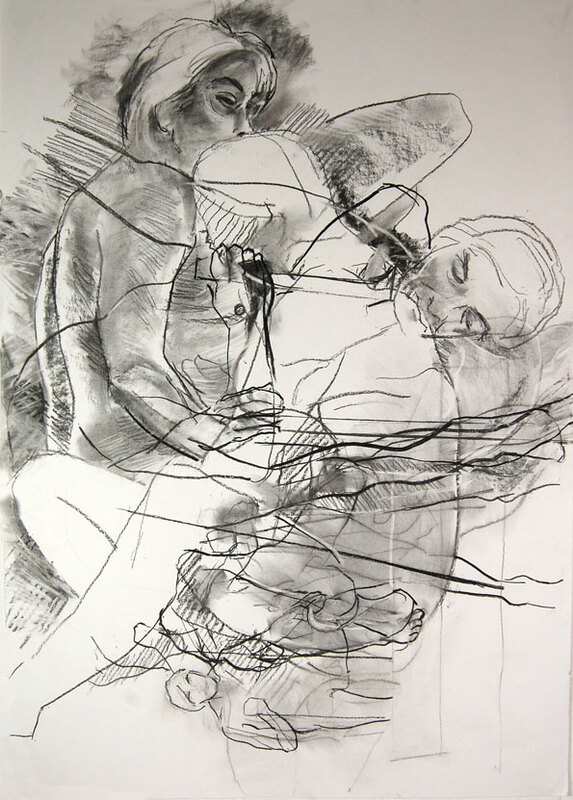 This drawing was made by taping a piece of charcoal to a 1 metre bamboo cane. It sounds far worse than it is and with patience, you can achieve accuracy and a good degree of fluency. It forces you to stand away from your easel and see all of the drawing all of the time rather than stepping back from your easel every now and then. “Study of a Leg” Charcoal on Cartridge. 841 x 594 mm © copyright chriswoodartist all rights reserved. Wow…I just thought I would nip in here to see your drawings and I’m glad I did. They are amazing! I will keep nipping in now and then. I have only just replied to the post you sent me on my About page as I didn’t get a notification. The seagulls say Hello! By the way! Wonderful. Love the alternate surfaces. Thank you kindly for following my blog – it was that which led me here and what a great blog from a clearly gifted individual – I am in awe and I’ve only just started to look around. Looking forward to more of your posts. Love your composition in “A Green Lady”. “Elle’s Back” reminds me of Picasso. Cool stuff! Praise before the sun is under the yardarm is praise indeed ! Many thanks – have great weekend ! Many thanks for your kind comment ! Cartridge Paper is usually a heavy paper used for illustration or routine drawing – it’s more commonly found in sketchbooks. I really like Fabriano Cartridge paper and buy it in 10 metre rolls. Sugar paper is also known as construction paper and is a course, cheap, tough paper that comes in a variety of colours and is the staple of most schools in the UK. The downside of coloured Sugar paper is that it often fades in strong sunlight, which is why (when I can afford it) I use Canson Pastel Paper. Yes I like heavier paper too . I’m from California and I know it as construction paper.Yes the paper fades. aahhh we are both drawing. It is my favorite thing to do. Enjoy the sketching. Looking forward to more. Blimey – what stunning drawings. More on http://www.artspace.co.uk Under artists : Chris Wood or my FB pages Chris N Wood or Chriswoodartist – many thanks for the comment !! Do you play around with any of the drawing apps? II’ve tried some but I go back to old fashioned drawing. Wow! What amazing drawings. You are right drawing is not a gift, it is a process and takes alot of time and observation in order to create. I especially enjoy your digital creation of your drawings as it makes it come to life. If you’d like give my art a look and tell me what you think, have a good one. Very interesting. Drawig the human figure is a challenging task and patience is absolutely necessary! Over the years I have learned to become more patient, more fluent and more realistic – tomorrow is another day !